In January James Weiner wrote a little about the browsers we support and during the summer we revisited that question to decide which operating systems, screen sizes and devices we would support at launch. As with all things on GOV.UK we’ll then be monitoring real data from the site and iterating our approach based on that, but I'm going to expplain how we decided what to support at launch. A few weeks ago the Google Apps team announced that they would be dropping support for Internet Explorer 8 in keeping with their strategy of supporting the current and prior major releases of Chrome, Firefox, Internet Explorer and Safari. But because we want to be the best place to find government services for as many people as possible we can’t rule out browsers that might still be in use. Being user centred doesn't end with our design; we're building this for you and we need to make sure it works for more than simply the majority case. Attempting to establish how many people use what is a difficult job. Wikipedia lists a selection of places you can find this data but their differing methodologies bring with them differing opinions and healthy debate meaning we have to tread carefully. The experience of launching the new GOV.UK font highlighted how significant the impact of an operating system can be on the look of a website. As you'd expect, the Microsoft family dwarfs Apple, and both dwarf Linux. However, our sources couldn't agree on the scale of that dominance. What they did agree on was the fragmentation of the Microsoft family. 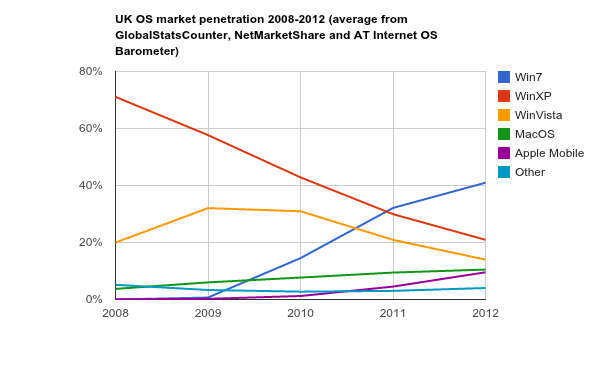 Since 2008 Windows XP has lost ground first to Vista and then to Windows 7 whilst MacOS has increased its market share steadily if not spectacularly. Mobile growth, by contrast, has been spectacular. In 2008 mobile contributed less than 1% of UK web traffic but this year it's approaching 11% - and the BBC reported recently that 33% of unique browsers accessing their Olympics content were from mobile devices. Again there’s a dominant name - in this case it’s Apple - but again the data we found couldn’t agree on how significant that dominance is. Unfortunately it’s not enough to simply say we'll recognise iOS, Blackberry and Android because with the growth of the mobile platform has come an explosion of different devices. This fragmentation was nicely demonstrated in a recent global study by OpenSignalMaps which reported 3,997 separate Android handsets and even Apple has now introduced a new level of variation with the iPhone 5’s longer screen. Many different devices means different screen sizes, ratios and resolutions. When it comes to visiting government we see a couple of different trends. On the departmental sites mobile devices are used less frequently than they are elsewhere on the Internet whilst traffic through m.direct.gov.uk is around 10% of the traffic enjoyed by the full version of the site. The second thing is that the traffic we do see is dominated by Apple where iPhones and iPads constitute up to 83% of the government's mobile traffic. Based on the data available we decided our pre-launch testing would use Apple iPhone, HTC Desire HD, HTC Wildfire S, Samsung Galaxy Ace, Samsung Galaxy S2, Samsung Galaxy S3, Blackberry Bold, Blackberry Torch, Blackberry Curve and Blackberry Storm. This list is clearly not exhaustive and is also going to be fluid as we move into the future. We'll be keeping an eye on our data to spot any emergent devices that might exhibit different behaviours and one of the team will blog later about the approach we’ve taken to designing for mobile. The biggest challenge to the consistency of your experience owes less to the split between desktop and mobile than it does the browser you’re using. To help us find out the state of the nation we used publicly reported usage information as well as GlobalStats and usage data from central government sites. This shows a clear link between choice of browser and the audience and content of a site. GlobalStats recorded 440 separate browser versions in July 2012 but 10 browsers provide 97% of all UK traffic with a 1, 2, 3 of Chrome, IE9 and the latest versions of Firefox. The visitors to government websites are different though so that means we're going to focus on the following 7 browsers. Over time what we support will change. The usage for the GOV.UK beta doesn’t give us a representative sample of browsing habits, so we’re having to make decisions based on external sources of information. Once we’re live we’ll have a lot of real data to work with which we intend to make available for other people to use when making similar decisions. Thanks for reading all the way through, and as always please take a look at www.gov.uk and let us know what you think of it. Following upgrade to vista from Xp i find that the download for Basic PAYE Tools is for various windows operating systems but not Vista!? Why not vista? I'm using it and thousands of other program writers manage to write programs for Vista as well. Why is this a problem for GDS. There's a complete lack of information on the subject anywhere. Epic fail !! Hi Paul, I'm afraid the Basic PAYE Tools are not something that the GOV.UK team have any control over and I don't know why the version of the software for the 2014-2015 financial year is not compatible with Vista. Unfortunately it does look like you might need to investigate an alternative piece of software, there's a piece of content on GOV.UK suggesting alternatives - https://www.gov.uk/payroll-software. Rather than looking at OS's, Browsers, etc., it might be better to look at rendering engines: Looking at the market share of Trident vs. Gecko vs. WebKit will give you much more information on what platfors to support (and how!) than the browser versions. Regarding the pre-launch mobile devices, "This list is clearly not exhaustive and is also going to be fluid as we move into the future" - have you got an updated list? Does that mean you will be supporting IE6? The current site doesn't render particularly well and is arguably unusable in IE6. Our goal is for GOV.UK to work in older browsers like IE6 and IE7, and to look great in modern browsers like IE8 and IE9, recent versions of Safari/Chrome/Firefox. We're not quite there yet - the team have a list of IE6 bugs that they're working through right now - but if you still have problems using it in IE6 from 17th October onwards then we'd be really grateful for bug reports (via https://www.gov.uk/feedback). Keeping track of browsers and devices is tough. In some ways though, with the advent of more consistent standards-following behaviour, the question isn't which devices you'll support, but which bugs on which browsers you're willing to develop fixes for. An excellent article - of wide general interest apart from its applications to the task in hand. Like many others although I have most major browsers installed and own an Android mobile, I still stick to IE (9) sinceI know it best - I guess I am saying that change is hard!